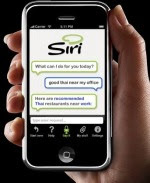 Siri is a new innovative creation which uses natural language processing to answer questions and make recommendations. Siri Assistant App has been created through SRI's CALO Project, America's largest Artificial Intelligence research project and the beneficiary of $150 million investment. It should be noticed that Siri is compatible only for iPhone 3GS and for 3G either but does not support iPod touch. Siri operates through voice recognition and it should be treated like a real person. You can even ask it if it's been having a nice day. It responds at once and finds necessary information within seconds. Siri can assist you finding the proper information you're looking for and with it's reliance on GPS location Siri will start searching the nearest things you've requested (if you want it so). Besides Siri Assistant can serve you a reminder of your businesses in scheduled time or purchase things through your phone. For example with the help of Siri you can book a flight, a hotel room and get a taxi at the same time. Siri Assistance is still free and and available in the iTunes App Store right now.